Monsters are very popular in our house right now. Fortunately, it's the cute Monsters, Inc. variety and not the scary under the bed kind. 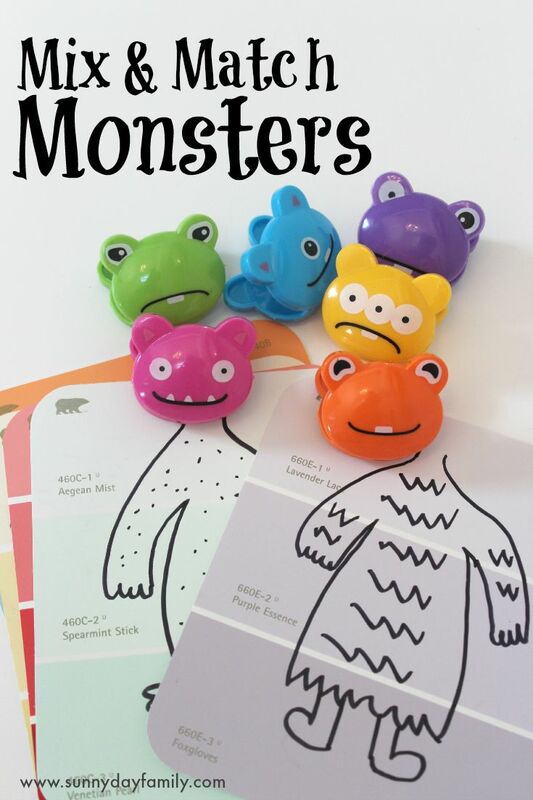 I saw these adorable monster clips in the store last week and knew the boys would love them, so I came up with a super easy activity that's perfect for busy bags or quiet time for monster lovers like us. This activity requires little set up and incorporates several learning skills... and it's lots of fun! Little hands can work on fine motor skills as they use the clips and it is great for practicing color matching skills too. To make your monster cards, simply draw a monster body on each paint chip card. Be creative, and don't worry about making them perfect. Just be sure to line up your clip to the top of the card first so you know where to start the neck. I love doing monster activities because I am not an artist, and it doesn't matter if your monster drawings are a little lopsided. That's part of their charm! That's it! You're ready to play. Set the monster body cards and clips out and invite your children to play. My boys took to this activity right away. They immediately wanted to match the colors of the clips to the bodies. They loved the silly monsters they created. This activity was great for both color matching practice and fine motor work. It's perfect for a busy bag to use for quiet time at home or when you need a screen free activity at a restaurant or in a waiting room. We love our little monsters! I was so happy with how they turned out and the boys loved them. They're perfect for Halloween too! 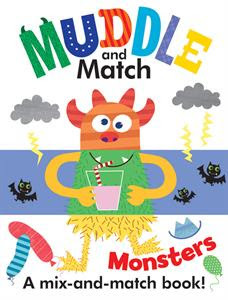 This activity was inspired by one of our favorite new books: Muddle and Match Monsters. This really fun board book lets you mix and match the pages to create your own silly monsters. It's a perfect companion to our Mix & Match Monster cards! Check it out. What silly monsters can you create with these Mix & Match Monster cards? Leave a comment below or message me on Facebook and let me know! Great idea to use this as a busy bag at appointments when kids have to wait! Love that. That's my favorite part about making monsters, too - the mistakes are what make them special! Love this idea - it's so perfect to go with those cute clips! These are brilliant! Such a great activity to go with the book too! Such a cute idea! Thanks for sharing at Toddler Fun Friday! Thanks everyone! We've had a lot of fun with them! I love these - and I especially love that you tied them into a book!